I’ve been doing lots of brick fireplace makeovers. My clients especially like that I use a stone plaster that can be colored with tinted glazes because it looks natural and modern. 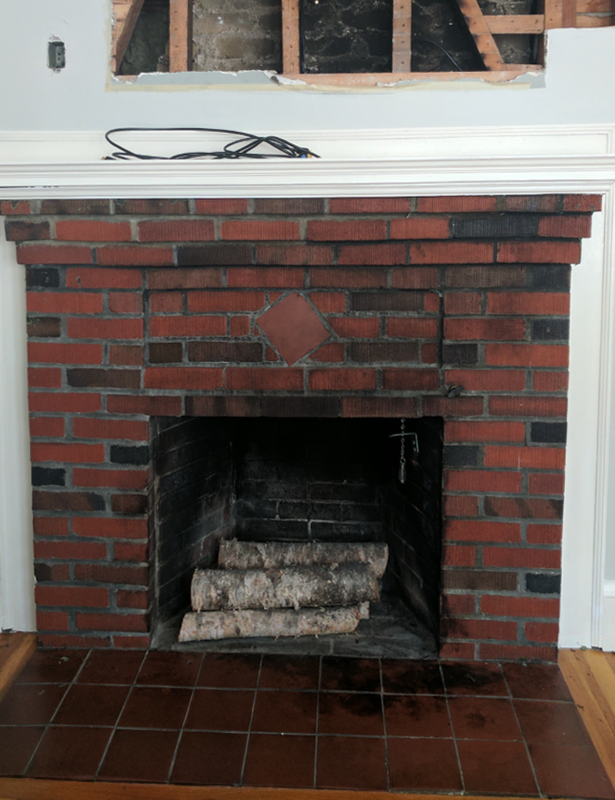 The young couple who purchased this home a few months ago wanted to make their heavily soot-stained brick fireplace pretty. As you can see from the “before” photo, it needed a lot of help. 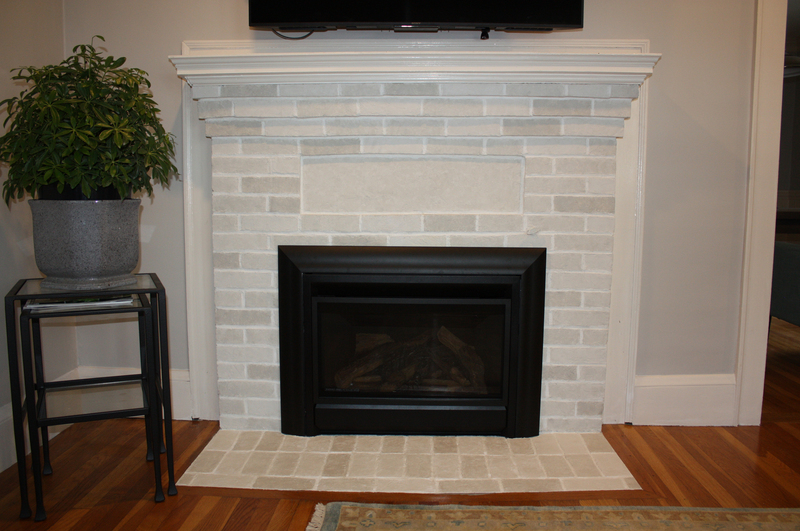 While searching on-line for ways they could make the fireplace blend in with the space, my client’s mother-in-law came across a brick fireplace makeover I did, and forwarded the photos to her daughter-in-law. She loved the way the fireplace looked with the varying tones on the bricks. We set up a time to meet, and after seeing my plaster fireplace samples she decided to have me do the project. Cleaning the soot off was very time-consuming. I usually use TSP, but I tried a product I hadn’t used before, Paint N’ Peel. The product is thickly applied all over the brick, and after it dries completely, it’s peeled off the bricks along with the soot. Most of it came off, but it was a little challenging to get everything off because the bricks had deep vertical grooves over the surface. 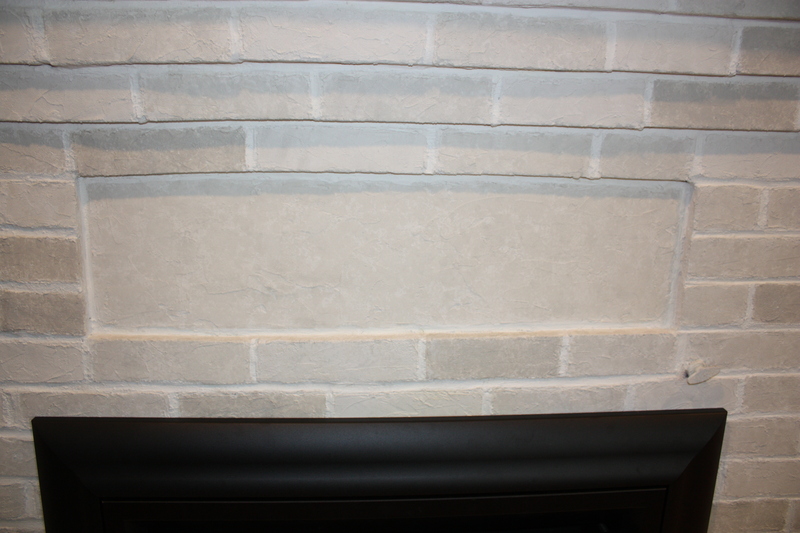 I decided to completely filled in the grooves and made the bricks smooth using the stone plaster product I use to do all of the fireplaces I makeover. I also filled in the uneven recessed area above the opening because the bricks were not uniformly placed, and it was messy looking. Tinted gray glaze colors coordinating with the wall color gave the fireplace a soft, cohesive look that blends in beautifully with the space. My clients were thrilled with the outcome! Definitely one of my favorite fireplace makeovers.